and not an English one. Can anyone tell me how to fix this. Not a major issue as I can change the names manually. The game uses the citylist of the language you are using. If you are playing in English, it will always go for the English citylist, even if you play pak.german, pak.japan or whatnot. copied citylist_de to that and made a new game. But the names are still English. I'm sorry to be a pest, but where do I go next? Hello again. I have found it!!! Now OK. Thanks for the inspiration. interesting. Or maybe it's just me. There is one other thing, if I may ask. The Kfv Car Plant requires petrol and diesel but the refinery seems to only deliver one or the other, not both?? Therefore I get no cars produced. Can I fix this? You can play the Scenario. This is an original german map, there are the cities in the right places with the right german name. The Car Fab 1905 need only petrol and the refinery 1905 give only petrol, this is historical correct. Cars were only built from 1936 with diesel engine, in large numbers but only from 1960. The Car Fab 1961 need petrol and diesel The refinery 1961 produce petrol and diesel. May be we should give the refinery 1905 diesel too. But the Car Fab 1961 needs Plastic too. The simple way: go to the map editor and build the modern refinery 1961 by yourself. Thank you Makie....problem solved. I just had not thought about it like that. haul the car trailer. This does not happen in every game but I have it now. At the moment exists no trailer/ car for car transportation in pakset before 1933. But the first car producer appears 1905. We have to fix that, but for a model I need fotos/ drawings from a real existing car transporter in this time. car factory there was no problem with car transport. Can't remember the year though. I think, there will be no trucks in the year 1905, to transport cars. The cars either drove themselves or were transported by rail. With ships, they were probably transported. We should modify a ship for car transportation. 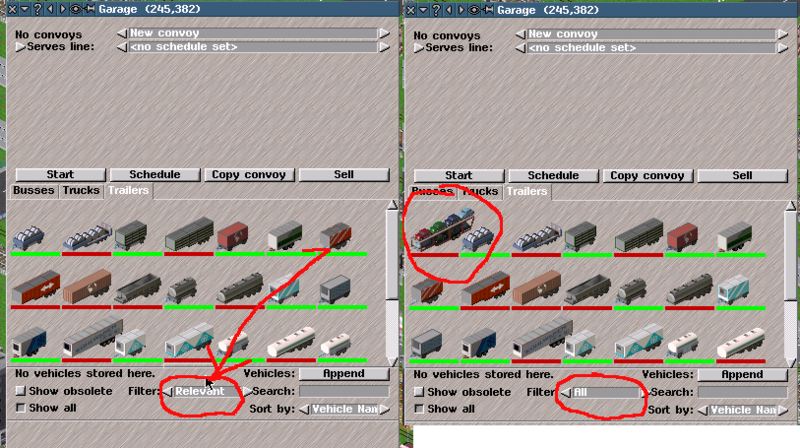 Well, I just now tried a new game, timeline 1990 and car factory 1961 and there is no problem with the car transporter. It's only in some games...not all. ok in the Depot you can filter "relevant" and "all" the first in the drop down menu. If there is no Car-Fab, or he think there is no, the car-trailer is not shown. But it was not in germany - and transportation of only one car with an other car is not very effective . But it is also only a mercedes that transports an other (race)mercedes. Rail transporter for 1905 exists in our pakset, a ship only from 1920. If nobody will find information about early car transportation in germany, I will create a new ship for next version of the pakset. Makie my garage is not showing "relevant". However, I have got it working by not selecting "timeline" By the way, I'm running Pak128 German v0.10.4. So now ok, my cars are being delivered. Hope this helps you too. Thanks.